Wesley Eric Weston Jr. (born March 3, 1981), better known by his stage name Lil' Flip, is an American rapper. He embarked on his musical career as a freestyle and battle rapper before earning a record deal with Suckafree Records in 1999. 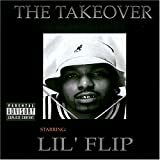 Lil' Flip is best known for his singles "The Way We Ball", "Game Over" and "Sunshine".